OOPS. I published this early, that's the second day in a row. BUT. I loved Skyfall. Very good, I loved how they combined just the right amount of old school Bond with new technology, CG animation and so much cool. I'm not as in love with Daniel Craig as everyone else seems to be though... Hugh Jackman is much better looking. Pity that he's a generation too old for me and I'm married. That wee rant had no relevance to my nails, at all. 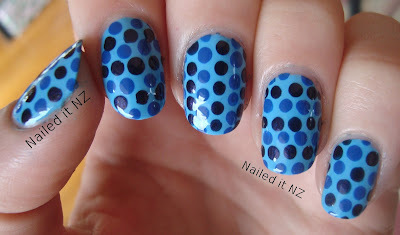 I did blue polka dots, they weren't perfect or anything but kinda cute. Check out the ring finger on this hand - cringe! I'm just using picasa for my watermark because my cousin isn't home and I'd feel a bit rude waltzing on into his room while he's out. If you've done today's nails, add them here! I painted my Aunties nails to match her outfit she was wearing to the races. I quite liked them! I always feel a little bit under pressure when trying to choose what to do on someone else's nails but these worked out alright! I love the colors you used for this. It's actually two colours that were getting low mixed together. A blue Miki polish and some white Revlon one. Love these blues !! Your aunt's mani is gorgeous !! Thanks! Blue's one of my favourite colours too. Skyfall is definitely worth seeing! I love you dots! I hear you on the doing others nails. I always get really nervous, but I also figure the only way I will get better and more confident is to do it more often. Now, where can I find an unsuspecting victim? I complained about it all the way home, lol, my poor husband :P. Thanks! These are really cute! I love the color scheme!